This review discusses the history of blue light-emitting diodes since 1923. Particular attention is placed on the slow but steady improvement in device efficiency since the 1970s. Work in the Japanese laboratories where the problems with blue device performance were finally solved in 1996 is emphasized. The discussion concludes with the award of the Nobel Prize in Physics to Nakamura, Akasaki, and Amano in December, 2014. In this paper we shall discuss the development of blue light-emitting (LED) and laser diodes (LD), starting early in the 20th century. Various materials systems were investigated, but in the end, the nitrides of aluminum, gallium and indium proved to be the most effective. Single crystal thin films of GaN first emerged in 1968. Blue light-emitting diodes were first reported in 1971. Devices grown in the 1970s were prepared by the halide transport method, and were never efficient enough for commercial products due to contamination. Devices created by metal–organic vapor-phase epitaxy gave far superior performance. Actual true blue LEDs based on direct band-to-band transitions, free of recombination through deep levels, were finally developed in 1994, leading to a breakthrough in LED performance, as well as nitride based laser diodes in 1996. In 2014, the scientists who achieved these critical results were awarded the Nobel Prize in Physics. Starting early in the 20th century, there were several reports of light emission from materials due to applied electric fields, a phenomenon which was termed “electroluminescence.” The materials properties were poorly controlled, and the emission processes were not well understood. For example, the first report in 1923 of blue electroluminescence was based on light emission from particles of SiC which had been manufactured as sandpaper grit, and which contained accidental p–n junctions. By the late 1960s, SiC films had been prepared by more careful processes, and p–n junction devices were fabricated, leading to the first blue light-emitting diodes (LEDs) . Electrical to optical conversion efficiencies were never more than about 0.005% . In the ensuing decades, blue SiC LEDs were never substantially improved, because SiC has an indirect band gap. Although many blue SiC LEDs were actually sold commercially in the early 1990s, they are no longer a viable product. In the end, the best SiC LEDs, emitting blue light at 470 nm, had an efficiency of only 0.03%. Starting in the late 1950s, various research laboratories such as IBM, RCA, and GE looked into the possibility of making infrared Light-Emitting Diodes, followed by visible light LEDs based on the III–V compound semiconductors. For example, at RCA Laboratories, Jacques Pankove reported infrared electroluminescence from GaAs in 1962 . The beginning of visible-spectrum LEDs made of ternary III–V alloy compounds dates back to 1962 when Holonyak and Bevacqua  (1962) reported on the emission of visible light from GaAsP junctions in the first volume of Applied Physics Letters. After significant efforts, in 1964 green GaP LEDs were formed with efficiencies as high as 0.6% by doping the GaP with N isoelectronic impurities . The N was added in the form of GaN particles to the growth melts used to form the p–n junctions. Improvements continued in the next several years for GaP green LEDs, and by 1968 these became commercial products . While the external quantum efficiency of green LEDs is less than that of red LEDs, the sensitivity of the human eye to green light is more than 10 times higher than to red light, so the apparent brightness of the LEDs is comparable. But extending the results to blue LEDs presented a new challenge. Both SiC and GaP have indirect band gaps. That means that an electron in the conduction band and a hole in the valence band have different values of momentum. To conserve momentum, a phonon must also be involved in the recombination process. This 3-body event suffers from low probability, and hence indirect band gap materials tend to have low emission efficiencies. But the presence of impurities in the semiconductor can relieve the conservation of momentum requirement by relying on Heisenberg’s Uncertainty Principle. Since the physical position of the impurity is precisely specified, the momentum of a carrier in its vicinity becomes unspecified. This argument has led to commercial products with both GaP and SiC. Gallium nitride films finally emerged out of the laboratories of the Radio Corporation of America (RCA) starting in 1968. RCA was an important center for compound semiconductor research. Starting in the mid-1950s, managers of the firm’s research laboratories in Princeton, New Jersey made significant investments in compound semiconductors. They recruited young PhDs to the compound semiconductor program and reassigned experienced researchers who had previously worked on silicon and germanium. By the late 1960s, RCA had one of the largest research groups on compound semiconductors in the United States with thirty PhD researchers and more than fifty technicians and associate researchers. Then, in 1965 and 1966, two young PhD chemists at RCA, James J. Tietjen and James A. Amick, developed a new epitaxial method for fabricating compound semiconductor crystals: halide vapor phase epitaxy or HVPE. Unlike liquid phase epitaxy, HVPE relied on the chemical reaction of different gases, including hydrides (hydrogen-based compounds) and halides (hydrogen chloride). HVPE had the advantage of offering more control of crystal growth than liquid phase epitaxy. The new crystal growing techniques enabled the firm’s researchers to fabricate a large number of compound semiconductor materials. They developed competencies in indium phosphide, gallium arsenide, and various gallium arsenide alloys, including gallium arsenide phosphide. Soon researchers at RCA and several other laboratories succeeded in fabricating red and then green LEDs. In the spring of 1968, Tietjen became interested in using his HVPE method to grow another III–V compound semiconductor material: single crystal films of gallium nitride (no other laboratory had yet produced such crystals). Tietjen thought that the growth of gallium nitride crystals would make it possible to fabricate blue LEDs. He surmised that gallium nitride, because of the position of gallium and nitrogen in the periodic table of elements, would have one of the widest band gaps among compound semiconductors. This wide band gap would make gallium nitride a valuable semiconductor for blue light emission. Tietjen further reasoned that gallium nitride-based blue LEDs would have great commercial potential. The compound semiconductor group at RCA already knew how to make infrared, red, and green LEDs, so advancing to blue devices seemed to provide no special challenge. Adding blue would make flat panel televisions possible and end the era of the venerable cathode ray tube. In the late 1960s Herbert Maruska was a young researcher in Tietjen’s group and Tietjen assigned him to develop a process based on HVPE for growing thin films of gallium nitride. Tietjen and Maruska settled on sapphire as the crystal substrate to grow gallium nitride; this was a prescient choice as the great majority of gallium nitride crystals have been grown on sapphire up to this day. Maruska then struggled for many months to find the right temperature for growing gallium nitride films. At first, he used low temperatures, in the order of 600 °C, to grow the crystals, because he misinterpreted the earlier results of Lorenz and Binkowski . He obtained only white powder. It was only by raising the temperature to 900 °C, the temperature commonly used for growing gallium arsenide, that he succeeded in making single crystal films of gallium nitride. This important breakthrough was accomplished on November 22, 1968. The GaN films always came with high n-type conductivity. In the succeeding months, Maruska studied a variety of possible p-type dopants. But he did not succeed in making a standard pn junction LED. Traditionally, pn junction LEDs were made of a sandwich of n-type and p-type layers, as exhibited in red GaAsP and green GaP devices. In fact, it would prove to be exceedingly difficult to make p-type gallium nitride over the next 20 years. In 1969, he tried to dope gallium nitride with zinc, the standard element which provides p-type doping in GaAsP and GaP. He also used magnesium, cadmium, mercury, and germanium. None of these efforts succeeded, however, because he had run into the major doping problem with gallium nitride that would plague researchers aiming at making blue LEDs for the next twenty years: poor crystal quality and impurity contamination. Tietjen and Maruska published an article on the growth of single crystals of gallium nitride in Applied Physics Letters in November 1969 . In early 1970, Jacques Pankove, an advanced researcher in the field of compound semiconductors, returned to RCA Laboratories from a sabbatical at UC Berkeley where he had written a textbook on optical processes in semiconductors. He soon joined the nitride research group to study gallium nitride. So did Edward Miller, a research chemist. Meanwhile, in March 1970, Maruska was awarded a David Sarnoff Doctoral Study Award. The Lab Director, Dr. Fred Rosi, assigned him to attend Stanford University and develop a bright blue GaN LED as his thesis project. In the fall of 1970, Maruska left to join the materials science and engineering department at Stanford University to commence his doctoral studies. At Stanford, he continued working on gallium nitride device structures with RCA funding and in close collaboration with Pankove. He remained an RCA employee. The prospect of commercial opportunities encouraged several electronics corporations to build research groups focusing on gallium nitride in the early 1970s. Among these firms were large U.S. corporations with significant research operations such as North American-Rockwell, Phillips Laboratories, and the Bell Telephone Laboratories. Several Japanese corporations such as Hitachi and Toshiba also followed the trend. Most researchers working on gallium nitride at these firms followed the RCA example and grew their films of gallium nitride with the HVPE method. When Maruska headed west to Stanford in September 1970, Edward Miller, who was in Dave Richman’s group, took over the growth of the gallium nitride films. He thus became Jacques Pankove’s collaborator, growing the films and passing them along to Pankove’s lab to fabricate devices and evaluate them. Miller originally had focused his efforts on trying to prepare conducting p-type GaN. 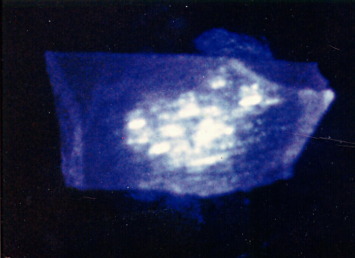 In the spring of 1971, Pankove took one of Miller’s Zn-doped samples and placed two probes on the surface. He then applied a dc voltage source between the probes. When the voltage exceeded about 60 V, green light at 515 nm was emitted in the vicinity of one of the probes (Fig. 1). 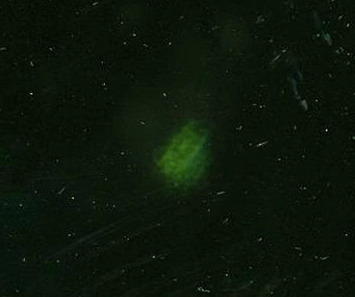 A microscopic investigation indicated that the luminescence consisted of a number of tiny spots located under the metal probe. This proved to be the world’s first report of electroluminescence from a GaN film. In May 1971, this result was submitted for publication . Ed Miller’s very first GaN green LED . 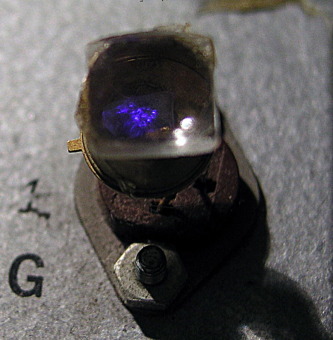 Soon Miller fabricated a blue LED (475 nm) as well (Fig. 2) . Pankove applied for a patent for GaN LEDs in 1971, and it was issued in 1972 . 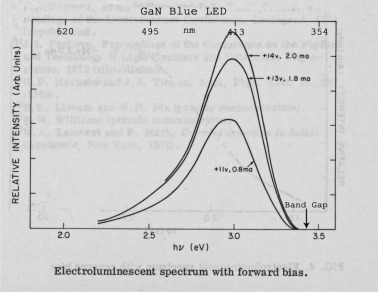 Pankove and Miller went on to produce a blue GaN numeric display based on Zn-doped GaN in November 1972 (Fig. 3). Pankove and Miller published numerous papers about their Zn-doped GaN LEDs in the next few years ,  and . Ed Miller’s first Zn-doped GaN blue LED . Early in the summer of 1971, Maruska requested and was sent all of the proprietary mechanical drawings for Tietjen’s HVPE reactor from RCA, where he was still an employee. The drawings were taken to the machine shop in the McCullough Building at Stanford, and soon the technicians were machining the necessary parts for the HVPE reactor. As the summer of 1971 went by and the parts were completed, the reactor was slowly assembled. In addition to the parts which were fabricated in the machine shop, many other pieces of equipment needed to be ordered from outside vendors. These included the controllers which were used for setting the temperatures of the furnaces, and reactor gases including a cylinder of hydrogen chloride, a cylinder of ammonia, and tanks of hydrogen. The hydrogen needed to be purified with a palladium diffuser. The reactor is shown below (Fig. 4). RCA-style HVPE reactor for GaN growth at Stanford University. 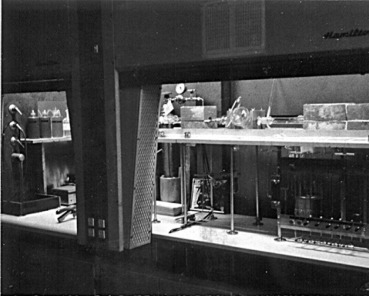 After Maruska had passed his doctoral qualifying examination on April 6, 1972, he was excited to get down to work and start to operate the new HVPE reactor. Naturally the reactor first needed to go on a shake-down cruise. This meant growing simple unintentionally doped material. By the middle of May, nice films of undoped GaN were being prepared. 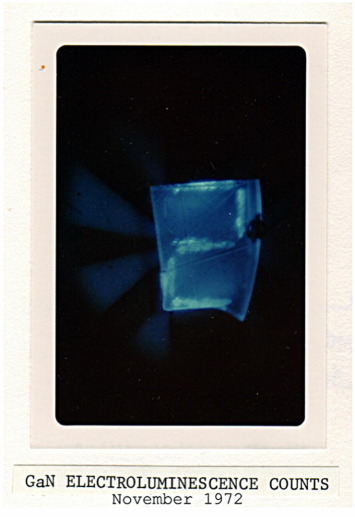 Next the use of zinc was commenced to form a thin doped layer above the thick undoped film, and it was not long before a green point-contact LED had been demonstrated. With a +70 V bias applied, green light peaking at 515 nm was observed in the vicinity of the positive probe. This was in agreement with the results of Miller and Pankove. Aware that a PhD thesis has to be based on original research, Maruska realized that he needed to adopt a different approach compared to his colleagues back East. He spoke at length with another graduate student, Walden C. Rhines, who sat at an adjacent desk in the McCullough Building at Stanford. They decided to substitute magnesium for zinc to create a novel acceptor. Soon they were preparing GaN films doped with magnesium which were pale yellow in color and electrically insulating. In early June of 1972, several device structures were prepared based on a thick undoped (n-type) GaN film topped with a thin Mg-doped insulating film. Point contact probes were used for providing electrical contact. 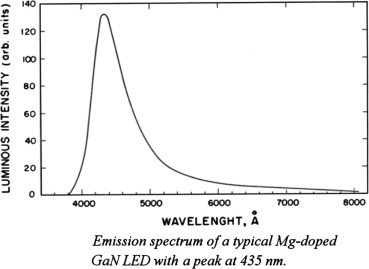 On June 8, 1972, after applying 150 V to a set of point contacts, the first example of violet light emission from Mg-doped GaN was observed. The emission peaked at 425 nm, which is indeed in the violet region of the visible spectrum. The human eye has very low sensitivity in this wavelength range, so such devices did not appear to be very bright, and in fact, looked blue. But they could be easily seen even with the room lights on. It was now time to make a functioning metal–insulator–semiconductor device. A schematic diagram is shown below. Typically a chip about 2 mm by 2 mm was cut from the sample. 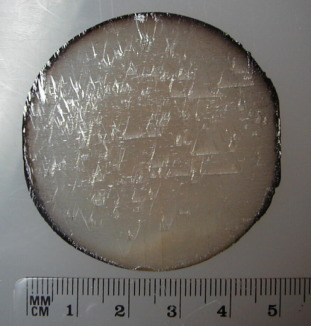 The top surface of the Mg-doped film was then coated with a large metal contact. A small metal contact was also formed on the side of the chip to make contact to the undoped GaN layer. An indium amalgam typically used to make contact to conventional GaAs devices was used for this purpose. The little diode was then placed upside down in a standard TO-5 header, where the large metal region over the Mg-doped film made direct contact with the metal of the header. A separate wire passed through the header from the back and contacted the undoped region from the side. The device was heated to 400 °C to drive off the mercury and provide a solid metal contact. Thus all of these early samples were subjected to a thermal annealing procedure. With a positive bias applied to the header base, light was emitted out of the top, through the sapphire substrate. 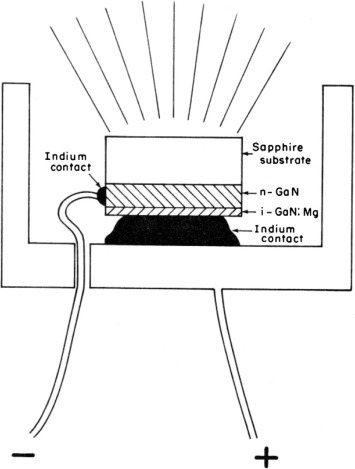 Rhines and Maruska published the first paper on Mg-doped blue LEDs in June 1972 . See Fig. 5 below. Physical structure of GaN:Mg LED . The first functioning GaN:Mg LED was demonstrated on June 28, 1972. After several changes in growth parameters, a sample was grown on July 7, 1972 which was easy to see in a well lit room with a forward bias of 10 V . See Fig. 6 below. Magnesium doping of gallium nitride would become the standard for future bright blue light emitters (see Fig. 7 and Fig. 8). Blue GaN:Mg LED prepared at Stanford on July 7, 1972 . GaN:Mg LED emission spectrum . Maruska’s blue GaN LED still works in 2014. Maruska finished his PhD thesis studies just in time for Christmas at the end of 1973. In January 1974 he returned to RCA Labs with a functioning blue LED in his attaché case, as he had promised. This device still works after all of these years. Its emission peak is at 425 nm. It can be seen at the Sarnoff Museum in The College of New Jersey near Trenton, NJ. A video demonstration of the device being connected to a power source and turned on appeared in the U.S. media in October 2014 and is available here: http://www.newsworks.org/index.php/thepulse/item/73871-the-blue-leds-nobel-worthy-lineage-traces-through-new-jersey. When Maruska returned to RCA in the fall of 1973, the department manager Dave Richman decided to pursue a new approach to nitride thin film growth. A novel method for preparing thin semiconductor films which did not involve the use of hydrogen chloride gas was just emerging. In 1971, Manasevit of North American Rockwell reported the first example of growing thin film nitride samples by the MOCVD (metal organic chemical vapor deposition) process which he had pioneered . In this approach, gallium is transported into the growth zone as trimethyl-gallium, and no chlorine is used. Maruska quickly set about building one of the world’s first MOCVD reactors, shown in Fig. 9. Maruska’s new MOCVD reactor, 1974. Unfortunately, all of the RCA devices had relatively low efficiency and remained dim due to the heavy contamination always present in the HVPE process. It was clear that in 1974 these devices were far from being ready for commercial production, although Rhines and Maruska had received a patent for the Mg-doped blue GaN LED . Due to the failure of RCA’s computer business in 1971 (the company had to absorb a $250 million dollar loss) the company entered dire financial straits. Persistent difficulties with gallium nitride growth and loss of funding forced Tietjen to cancel the project early in 1974. In 1975, just a year after returning from Stanford with his doctorate, Maruska was laid off. Miller was let go as well and Pankove was reassigned to other projects within the lab (he then moved to the University of Colorado). This decision to close down the gallium nitride project was part of a major reduction in the size of the compound semiconductor program at RCA. The RCA team was so close, but they were not given the chance to cross the goal line. Interestingly, firms that did not experience the same financial crisis as RCA, including many of its Japanese competitors, left gallium nitride research around the same time. Unable to make pn-junction LEDs, Bell Labs researchers were among the first to abandon the field. Other corporations followed suit, such as Philips, Hitachi, and Toshiba. A consensus grew among compound semiconductor researchers that gallium nitride was an intractable material and that working on it was a waste of time and resources. The 1970s and early 1980s continued to be fruitless for GaN, although some research groups continued to fuss with the HVPE process, especially Guy Jacob with the French group working for Phillips . In 1976, Jacob et al. used a standard Maruska-style HVPE reactor to grow GaN films and discussed their attempts to anneal Zn-doped films . They found that when annealed in nitrogen or argon, GaN decomposes if T > 970 °C. When annealed in hydrogen it decomposes when T > 600 °C. However, when GaN films were annealed in steadily increasing ammonia pressures, then the net n-type carrier concentration was reduced. Other early researchers also attempted to anneal GaN films which contained the most common p-type dopants, Zn or Mg. But breakthroughs in GaN device fabrication began starting in 1983. The introduction of the metal–organic chemical vapor deposition (MOCVD) process, pioneered by Manasevit at Rockwell in Los Angeles in 1971, allowed the introduction of cold reactor walls and is free of HCl, eliminating oxygen contamination from the growth vessel or from the HCl (which is always contaminated with water). New work on the growth of GaN was advanced by Asif Khan et al. at Honeywell starting in 1983 . Kawabata et al. at Matsushita reported the first blue GaN LED grown by MOCVD in 1984 . Using a rapid growth rate of 15 microns/h, they grew a 30-micron-thick n-type layer followed by a Zn-doped layer and got blue light emission. Next, in 1986, Amano et al. applied the buffer layer concept, which greatly improved the structural quality of GaN films . Efforts to reduce the densities of dislocations in GaAs1−xPx films in the late 1960s had been centered on the growth of so-called buffer layers. A dislocation is actually either an extra plane of atoms or a missing plane, both of which cause stress in the lattice. It had been determined that by first growing a GaAs buffer layer, it is possible to eliminate some of the non-conforming lattice planes, and hence to reduce the dislocation density in the final GaAs1−xPx device. With the GaN program, Miller had also sought to improve the lattice structure by growing films of undoped material to act as buffer layers, but the nitride program at RCA was terminated before he succeeded. Basically, the essential role of the buffer layer is to supply nucleation centers having the same crystalline orientation as the substrate and to promote lateral growth due to a decrease in interfacial free energy . In 1994, Wickenden et al. demonstrated that GaN nucleation layers deposited at 540 °C on 〈0001〉-oriented sapphire substrates have a measurable crystalline component, although the lack of absorbance features associated with the direct band gap of GaN suggests that the crystallite size is very small . Upon annealing to higher temperatures, the crystallite size increases and the crystal perfection improves until at temperatures near those empirically determined to be optimum for epitaxial growth, it approaches that of good quality heteroepitaxial films. Most of the recrystallization of the nucleation layer occurs during the ramp from the deposition temperature to the final temperature. What was really wrong with Maruska’s HVPE method? The first attempt to explain the problem was given by Born and Robertson . They determined that the electrical characteristics of the layers were affected by the major impurity in the system which was water. The commercial ammonia gas available at the time had a water content as high as 1000 ppm. At the same time, Monemar and his group  noted that the concentration of a large number of impurities in the material grown by Maruska’s HVPE technique were at ppm levels. They suggested that an effort toward a refined growth technique might therefore give a material of considerably higher potential for applications such as blue-emitting LEDs than was presently available. An upgrading of the present growth procedure for GaN to avoid chemical contaminants at the ppm level seemed to be necessary before one could hope to prepare low-ohmic p-type GaN. Seifert indicated that oxygen was present in the form of H2O contamination in NH3, in the HCl gas, as well as a residual impurity in every hot-walled reactor system manufactured from silica. The last item refers to the reaction at high temperatures of HCl with SiO2 which forms the walls of the reactor, to create SiCl4 and release oxygen . Fortunately, at that time, manufacturers of ammonia were cleaning up the contamination problems in this precursor gas as well. The undoped material now began to have much lower n-type carrier concentrations, between 1017 and 1018 cm−3. In 1988 Amano et al. 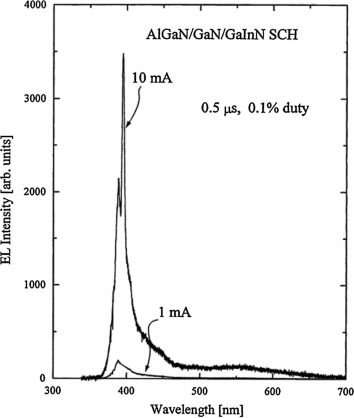 reported on improved luminescence from Zn-doped GaN grown by MOCVD after electron beam annealing . With Zn-doped films, they found a large increase in the intensity of 430 nm cathodoluminescence after electron beam irradiation in the scanning electron microscope. Contrast this with the RCA results in the 1970s which lacked any good results with the electron beam annealing of contaminated HVPE GaN:Mg material. 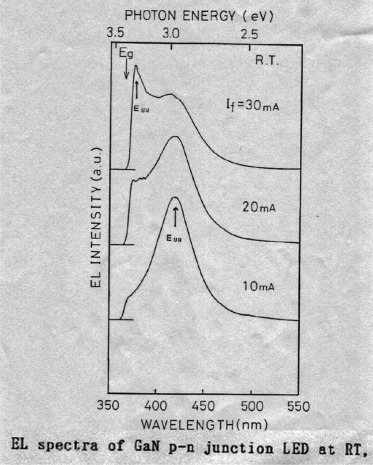 The big breakthrough came for Akasaki’s group in 1989, when they announced low resistivity p-type samples with low energy electron beam (LEEBI) annealed Mg-doped GaN in a scanning electron microscope . This process was explained by the following dynamic physical model firstproposed by Van Vechten et al. to explain GaN p-type conversion by LEEBI annealing. Electron beam excitation generates free electrons and holes which stimulate the breaking of acceptor-H bonds. Atomic H released from the dissociation of acceptor-H bond diffuses and may recombine with another atomic H to form H2 molecules which can escape from the crystal . The world’s first nitride blue LED containing a pn junction made its debut at a conference in Los Angeles in 1989 . 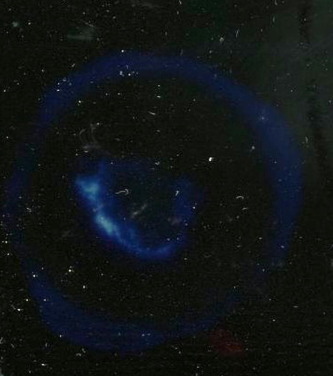 The device was still not very bright, but the light it emitted was certainly blue. This blue gallium nitride LED apparently was based on carrier injection rather than impact ionization, although we must inquire why it provided blue rather than ultraviolet band gap emission. The next step was to build a double heterostructure device, where the GaN active layer was sandwiched between two AlxGa1−xN confinement layers. This took Akasaki and Amano another two years. Akasaki reported their new results at the fall meeting of the Materials Research Society in Boston in December, 1991  (see Akasaki’s results below in Fig. 10). Akasaki’s new brighter blue LED in 1991 . Soon after Akasaki’s important advances with buffer layers and low-energy electron beam annealing, Nakamura realized the advantage of thermal annealing of GaN films, which he grew by MOCVD, to produce highly conducting p-type layers . Thermal annealing is a uniform process, unlike electron beam annealing. He thus was able to prepare bright and highly efficient blue LEDs based on GaN:Mg using standard thermal annealing . SeeFig. 11 below. Nakamura’s blue emitting GaN:Mg LED . 8. But why were they blue? The problem that needs to be addressed here is why are all of these GaN LEDs from the early 1990s were emitting blue light even though they are supposed to feature pn junctions? The band gap of GaN is 3.4 eV, so conventional band-to-band recombination should give emission centered at 364 nm, which is in the ultraviolet. All of the old results from the 1970s exhibited emission of blue light, usually in the range of 425–450 nm (see Fig. 12 below) . An often invoked band diagram for GaN blue LEDs shows recombination across a band gap from the conduction band to the valence band. If this diagram actually applied to the case of GaN “blue” LEDs, then we should only see ultraviolet light emission. Obviously, this diagram is misleading. We would like to propose an alternative diagram. Electroluminescence spectrum of a Maruska LED in 1973 . In 2015, when companies grow the p-type region of their commercial GaN LEDs, they continue to dope it with Mg. The doping concentration is about 1 × 1020 Mg/cm3. If they make a Hall Effect measurement, they find about 1 × 1017 cm−3 holes after an in situ thermal anneal. Thus only 0.1% of the Mg is activated. Then each unactivated Mg atom continues to have a hydrogen atom associated with it, and the H provides the third electron that satisfies its bonding requirements to replace a gallium atom in the crystal lattice . Thus the present day commercial GaN LEDs will exhibit UV electroluminescence emitting 365 nm. But there is also blue electroluminescence at 450 nm. The blue light-emission requires traffic through the deep Mg–H levels. In order for the blue light-emission to occur, an electron must be removed from the deep levels by some process such as impact excitation. An electron that had been injected into the p-type material from the n-type region recombines with the newly created hole in the Mg–H complex, and then this electron completes its journey by recombining with a hole in the valence band, a hole that is associated with the bare Mg atom. This is shown in Fig. 13. This is the same mechanism for the blue emission that Stevenson and Maruska advanced in 1974 . The Japanese researchers succeeded in adding the UV emission to their devices by activating 0.1% of the Mg atoms to provide holes in the valence band. That is why their devices still emitted blue light. Correct band diagram when deep levels are present. Let us summarize here the set of events which have been accumulating since 1971 which allowed researcher teams of Akasaki and Amano and Nakasaki to finally demonstrate a truly bright blue GaN-based LED in 1994. First of all, they used the MOCVD thin film growth technique from Manasevit of North American Rockwell, who first used it to deposit high quality nitride films in 1971. They based their early LED structures on the ones first demonstrated by Pankove with Zn doping, also in 1971. They used magnesium doping approach developed by Maruska and Rhines to acquire p-type doping, and their thermal annealing process to activate the Mg dopants. They also used the 1972 electron beam annealing process as an alternative approach to activate the Mg dopants. They also used Miller’s buffer layer approach for reducing dislocation densities. And they were fortunate that much purer sources of ammonia became available over the years. But their breakthrough work was yet to come in 1994–1996. One cannot basically achieve a blue LED with a simple GaN film, because the band gap energy is 364 nm. To move the band gap energy into the visible spectrum, efforts were made to add InN to the GaN material to form an alloy with the band gap varying from 2.0 to 3.4 eV. Nakamura and Mukai developed the first high quality alloy films of GaInN in 1992, which will lead to true blue and green LEDs and LDs featuring band-to-band recombination processes . There is a very high vapor pressure of nitrogen over InN, making growth of nitride films containing significant concentrations of In quite difficult. But with alloys containing just a few percent indium, violet LEDs proved possible. In 1993, Nakamura et al. described their early advanced p-GaN/n-InGaN/n-GaN DH violet LEDs. The InGaN films were grown by the two-flow metalorganic chemical vapor deposition (MOCVD) method. Sapphire with (0001) orientation (C face) was used as a substrate. Trimethylgallium (TMG), trimethylindium (TMI), monosilane (SiH4), bis-cyclopentadienyl magnesium (CpzMg) and ammonia (NH3,) were used as Ga, In, Si, Mg, and N sources, respectively. The thickness of the GaN buffer layer was approximately 25 nm. Next, the substrate temperature was elevated to 1020 °C, and the Si-doped n-GaN film was grown for 60 min to give a film 4 μm thick. Now the Si-doped active InGaN quantum well, with an approximate thickness of 10 nm, was deposited at 800 °C. After the Si-doped InGaN growth, the temperature was increased to 1020 °C to grow the Mg-doped p-type GaN film.Fig. 14a shows the electroluminescence (EL) of the InGaN/GaN DH LEDs at forward currents of 10 and 20 mA. The peak wavelength was 420 nm. Other peaks were not observed at all. They controlled the indium mole fraction (X) of InGaN active layer by changing the growth temperature or indium source flow rate during InGaN growth. Thus, they demonstrated that the peak wavelength of the EL emission of DH LEDs can be changed. This is shown in Fig. 14(b). This second group of DH LEDs was grown under the same conditions as the first batch, except for the Si-doped InGaN growth temperature, which was changed to 820 °C. The second batch of LEDs showed a peak wavelength is 411 nm. In view of these results, these violet emissions of InGaN/GaN DH LEDs can be assumed to take place through recombination between the electrons injected into the conduction band and holes injected into the valence band of the InGaN active layer . Electroluminescence spectra of InGaN based LED devices . Candela-class high-brightness InGaN/AIGaN double-heterostructure (DH) blue-light-emitting diodes (LEDs) with the luminous intensity over 1 cd were first fabricated in 1994. As an active layer, a Zn-doped InGaN layer was used for the DH LEDs. The typical output power was 1500 μW and the external quantum efficiency was as high as 2.7% at a forward current of 20 mA at room temperature. The peak wavelength of the electroluminescence was 450 nm. This value of luminous intensity was the highest ever reported for blue LEDs up to 1994 . Akasaki and Amano reported LEDs based on GaInN in early 1995. 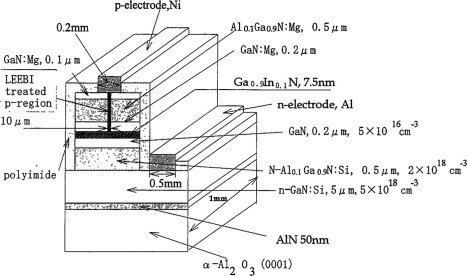 A p-AlGaN:Mg/p-GaN:Mg/GaInN/n+-GaN:Si/n-AlGaN:Si stacked heterostructure was fabricated. This heterostructure was grown on the n+-GaN layer. A p-type stripe structure was prepared with the LEEBI treatment of the Mg-doped layers. The EL spectrum showed narrow and intense band-to-band transitions with the emission wavelength, determined by the In content of the GaInN layer, around 400 nm . Finally, in 1995–1996, both of the research teams, Akasaki and Amano, and Nakamura, develop the critical device structure that made true blue emission possible from nitride semiconductors. The basis of their devices is an alloy of InN and GaN . The formation of an InxGa1−xN recombination section in the device allows them to exactly define the emission wavelength. 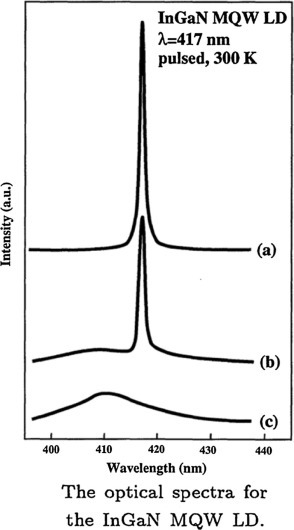 They controlled the indium mole fraction (X) of InGaN active layer by changing the growth temperature or indium source flow rate during InGaN growth . Thus, the peak wavelength of the EL emission of DH LEDs can be changed . And by configuring it as a quantum well, it need not be doped. The quantum well acts like a “bucket”, where holes are poured in from the p-type cladding layers, and electrons are injected from the n-type cladding layers on the other side. It does not matter if the Mg dopant in the p-type cladding layer provides any deep levels: the recombination is band-to-band in the well. And Nakamura’s team reported the first actual blue InGaN quantum well laser diode device in January, 1996 . There is just a single emission peak at 417 nm. In November 1995, Akasaki and Amano reported the fabrication of a novel GaN/GaInN quantum well structure. This led to the first report of stimulated emission, by pulsed current injection at room temperature, from a group III nitride heterostructure using a very thin active layer. 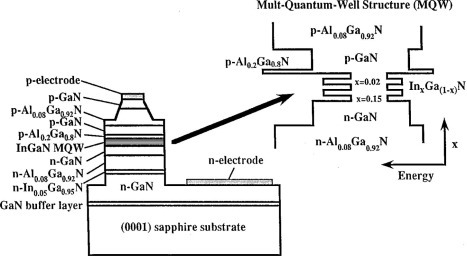 The nominally undoped GaN/GaInN MQW was fabricated by MOVPE on a sapphire (0001) substrate using an AlN buffer layer. The Multi-Quantum Well (MQW) structure was created on an unintentionally doped 1.8 μm thick n-GaN film. Each GaN barrier was 7.5 nm thick and each GaInN well was 2.5 nm thick. The InN molar fraction in the GaInN well was 0.07. A schematic diagram of the Akasaki/Amano device is shown in Fig. 15. Their first observation of stimulated emission from a quantum well nitride structure is shown in Fig. 16. In 1996, Akasaki and his group reported room temperature operation of a GaInN-based laser diode under current injection . Schematic structure of Akasaki and Amano’s MQW nitride structure . Akasaki and Amano’s first quantum well nitride device . Much work in this field has been performed by Nakamura and his team at Nichia . The growth was performed by MOCVD, generally at atmospheric pressure. As usual, structures were grown on c-plane 〈0001〉 sapphire, with a low temperature (550 °C) GaN buffer, a thick n+-GaN lower contact region, an n+-InGaN strain-relief layer, an n+-AlGaN cladding layer, a light-guiding region of GaN, then a multiquantum well region consisting of In0.15Ga0.85N wells separated by In0.02Ga0.98N barriers. The p-side of the device consisted of sequential layers of p-AlGaN, p+-GaN light-guiding, p-Al0.09Ga0.92N cladding and p+-GaN contact. A ridge geometry was fabricated by dry etching down to the p-Al0.08Ga0.92N layer), followed by formation of a mirror facet. The typical Nichia structure is shown in Fig. 17 . The emission spectrum is shown in Fig. 18. Schematic of the structure of a Nichia nitride laser structure . Emission spectrum of Nakamura’s first true blue nitride laser diode . These original quantum well devices warrant the 2014 Nobel Prize in Physics, which has been awarded to Akasaki, Amano, and Nakamura. A few words about the subsequent careers of Rhines and Maruska. Wally Rhines graduated from Stanford University in 1972. He joined Texas Instruments and moved to Texas. He earned a Masters of Business Administration from Southern Methodist University. Rhines worked at Texas Instruments (TI) from 1972 to 1993, serving as executive vice president of the semiconductor group and president of the data systems group. Rhines became CEO of Mentor Graphics in 1993, when the company’s annual revenue was about $340 million. The company passed $1 billion in revenue for the first time in 2011. Mentor Graphics is the largest private corporation in Oregon. He is no longer directly involved with nitride device studies, but maintains his interest in the field. After being ejected from RCA in 1975, Herb Maruska worked at a number of companies, both large and small, in the semiconductor field. He was involved with both light-emitters and detectors (solar cells). In 1999 he joined a start-up company in Florida which sought to prepare free-standing GaN wafers for use as substrates for homoepitaxial growth of nitride devices (Fig. 19). He designed and built a new style combined MOCVD + HVPE reactor. Despite valiant efforts, there were no useful results. In 2003 he joined Asif Khan at the University of South Carolina where he worked on the MOCVD growth of wide-bandgap GaAlN devices. Maruska was forced to retire in 2006 due to health issues. He also maintains an interest in the nitride field. Free standing GaN wafer prepared by Maruska in 2003 in Florida. , please visit:www.galliumnitrides.com or send us email at gan@powerwaywafer.com.